In the entrance procession, the Knights of Columbus form an honor guard for the presider, Cardinal George. 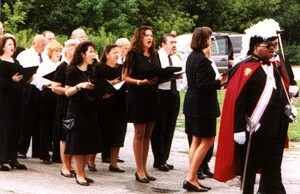 In procession, the choir is directed and led by Marty Bramlette. The choir sings verses of Psalm 107 in Psalm Tone 8, from the hymnbook. The people sing Alleuia, in response to each verse of the Psalm. 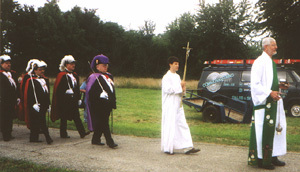 Now moving north, the procession is led in good order by Deacon Ray Deabel. He is a full-time chaplain at St. James Hospital, Chicago Heights. From the left are Deacon John Leonas, Father John McDonnell, Cardinal George, Most Rev. 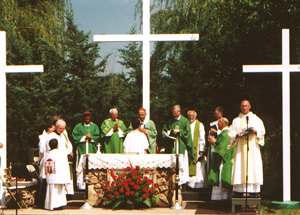 Joseph Perry, Fathers Michael Gilligan, Ed Gleeson, Jakob Thekeparampil, Sixtus Agostini (Comboni), Lou Cameli, Ron Kondziolka, Wayne Prist, Deacon Bob Bonta (carrying the Gospel Book), and John Pelley, in the choir. On the left is Father Ed Gleeson, pastor of the historic St. James Church in Lemont. His parish also uses the Leaflet Missal, as well as San Rocco. Father Jacob Thekeparmpil is a friend of Father Gilligan, from the Societas Liturgica. Dr. Thekeparmpil is a scholar of Syriac liturgy, from which is derived his own Syro-Malankar Rite of the Catholic Church. Historically, with the Syrian Orthodox Church, his Church has a high christology, much like that of the Coptic Church. He is from Kerala, India, where he is director of the St. Ephrem Research Institute. Father Michael Zaniolo has helped at San Rocco, especially for the San Lorenzo Festival. He is now chaplain at O'Hare Airport. As the entrance procession concludes, the people sing "Ad Multos Annos" ("For many years may you live!") to Cardinal George. This is the first of two songs in acclamation of his coming. After the Opening Prayer by Cardinal George above, all sit down. Now that the Introductory Rites are completed, there is a short break before the Liturgy of the Word begins. Angela Palanca then sings "O Thou that Tellest Good Tidings to Zion," from the Messiah. 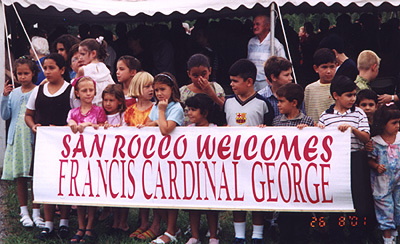 (This is also directed to Cardinal George, because he is the one who decides that San Rocco shall continue in existence.) The Liturgy of the Word then follows. Seeking what he considered a final gesture of approval for the re-establishment of the San Rocco community, August Anzelmo invited Cardinal George to come to the oratory to celebrate Sunday Mass. 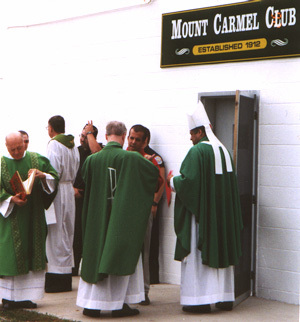 The Cardinal responded affirmatively to this invitation and came on Sunday, August 26, 2001, at Noon. The clergy vested in the nearby Mt. Carmel Club, to the east, on Wentworth. 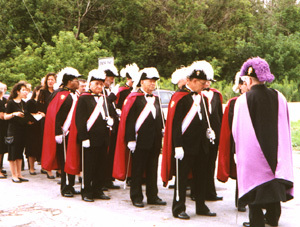 The opening procession moved west on 21st Street, to the pathway leading to the grotto area. There, the procession moved north, passing through the large tent set up for the occasion. The sanctuary area, already set in stone, easily accommodated the place where our bishop, Cardinal George, would preside, with the clergy around him, in the form of a crown. The choir stood on risers, moved from the church building. The congregation, some distance away from the clergy, was seated under the tent. It was a warm day, and the sun's radiance was strong. There were 300 chairs set out, all of which were taken. Total participation was estimated at about 390, including people from the neighborhood, especially nearby St. Paul's Church. There were also some guests from Infant Jesus of Prague Church in Flossmoor. Four deacons assisted the bishop and the congregation: Bob Bonta, Ray Deabel, Gene LaBelle, and John Leonas. 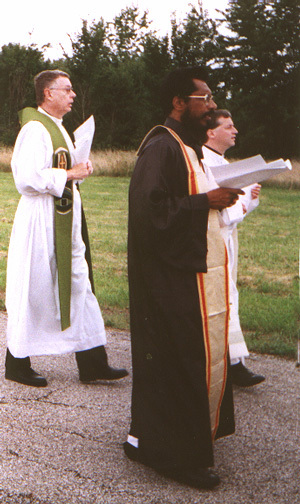 Bob Bonta was a deacon of the Gospel; he carried the Gospel Book in procession and proclaimed the Gospel itself. 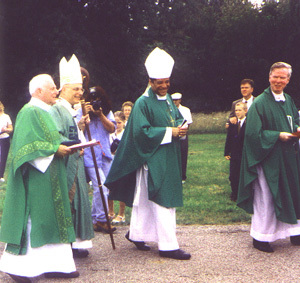 Ray Deabel carried the incense and led the entrance procession; he also attended the bishop, Cardinal George. Gene LaBelle was a deacon of song; he led the congregation's singing and sang the petitions of the General Intercessions. John Leonas was a deacon of the Eucharist; he helped with Communion and attended the bishop. In this way, the bishop is surrounded by his presbyters ("priests") and helped by his deacons. In the celebration itself, we see clearly the threefold ministry of the ordained, the very structure of the Church. The preeminent manifestation of the local Church is present when the bishop, as high priest of his flock, celebrates the Eucharist and particuarly when he celebrates in the cathedral, surrounded by his college of presbyters and by his ministers, and with the full, active participation of all God's holy people. This Mass, which is called the stational Mass, shows forth the unity of the local Church as well as the diversity of ministries exercised around the bishop and the Holy Eucharist. Hence, as many of the faithful as possible should come together for a stational Mass. Priests should concelebrate with the bishop; deacons should assist in the celebration; and acolytes and readers should also carry out their ministries. The form of the stational Mass should be retained . . . during pastoral vistitations. The stational Mass should be a sung Mass, in accord with the provisions of the General Instruction of the Roman Missal. It is preferable that, as a rule, at least three deacons, properly so called, assist in a stational Mass: one to proclaim the Gospel reading and to minister at the altar, two to assist the bishop. If there are more than three deacons present, they should divide the ministries accordingly. At least one of these deacons should be charged with assisting the active participation of the faithful [for example, the singing of the congregation]. The bishop . . . should be received in a manner suited to the circumstances of the place and the situation. If this seems appropriate, the bishop may be solemnly received and greeted by the clergy at the door of the church. But the bishop may even be escorted to the church with festive song, when this is feasible and appropriate. A dignified solemnity in receiving the bishop is a sign of the love and devotion of the faithful toward their good shepherd. The stational Mass, then, is no longer to be seen as a Mass with greater ceremonial and solemnity on the occasion when the bishop celebrates the Eucharist. Rather, the stational Mass should be a symbol of the local Church at prayer, the Church presided over by the bishop of the diocese. As the pastor ("shepherd") of the whole diocese gathers with members of all the orders of the clergy, with those who exercise the various liturgical ministries, and with the faithful of the diocese, to be united with them as the praying Church. Hence, each stational Mass must represent both the unity and diversity of the ministries and people of the local diocesan Church, just as the stational Masses of the ancient Roman Church reflected the unity and diversity of that city. Whether celebrated in the cathedral, as the mother church of the diocese, or in the smallest parish church, the stational Mass must be a manifestation of the diocesan Church. It is appropriate to emphasize at this point that the form that the stational Mass takes must be adapted to concrete circumstances. What is done in a small church cannot be the same as that which takes place in a cathedral, and yet each must clearly reflect the theological reality of the stational Mass. The stational form of Mass is used for solemnities, for the Chrism Mass, the Mass of the Lord's Supper, feasts of diocesan saints or patrons, large gatherings, and pastoral visitations. On other occasions, the bishop may well wish to celebrate in a simpler manner.